The 11th. I was dreading this moment because I just don’t “get” the 11th. I have Uranus there in my personal birth chart, so I should get it and that’s what’s so frustrating. Uranus rules that house! We’re told this house [meaning this common area of our lives] has to do with community and also with hopes and fears and friends. Really? all that? 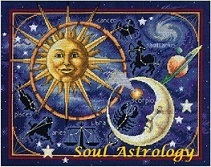 Some of those archetypes come from Horary astrology and some from the opposite of it’s polarity. Makes sense, doesn’t it that if Leo/5th is about “me” then the opposite polarity is about others, the collective–therefore, groups or humanity. Could we think of the 5/11 axis in relation to me and them? And could them be friend or those of like mind? Or those in the community that are a selective group, a singular type identity? Maybe? I’m still trying to understand the “hopes and fears” part of the 11th’s archetype but let’s go with what we’ve got. The group thing. I have a great example of this. The Moon just left my 11th house and something happened in my life that relates to this archetype in a pretty significant way. Without giving unnecessary details let me summarize by saying that as the Moon was passing through my 11th house of community and selective groups of like nature or like mind, I found myself discussing how I may be of service to a selective group of people in the community. I do have Cancer in the 11th by birth and the Moon there was strongly related to doing a type of nurturing in the community–the Moon/Cancer relates to nurturing, care giving. And in this case, care giving to a particular group of individuals but on a one-to-one basis which relates to the Uranus/Aquarius archetype of individuation or singularity. Remember, Uranus rules this part of our life… group but alone in a group would be a way of saying it or a small or selective group. Generally speaking, when the Moon moves through your 11th house it is a good time to connect with friends or groups. Giving or receiving “emotional” support–the Moon relates to emotion. Organizations (group energy) may provide helpful perspective on current conditions at this time. Or vice versa, you may provide a helpful perspective to a group or organization at this time as well. That could be a 2-way street, so-to-speak. An alliance is what the Moon [your emotional nature] is looking for to find it’s comfort, security and happiness at this time. Queen Luna is looking for her tribe and wants to feel some sort of meaningful membership somewhere or somehow i.e. this is who i am and this is my group. One’s heart can identify with the community at this time to a great extent and the tribe (in whatever way the emotional nature identifies tribe) will be prominent when seeking happiness, security and emotional nurturing. The only red flag with this one would want to be careful not to be overly influenced by group energy–we’re talking about a Uranian house after all and Uranus/Aquarius is pretty much alone in a group. Just a bit of trivia: Aquarius is thought to have a connection to circulation, the blood circulation in the body. In Horary astrology it is thought to represent the partners ability to have children since it is 5 houses away from the 5th of the other partner. But, that again is trivia. The hopes and fears archetype originates from the connection with Jupiter (Horary astrology). It is said that Jupiter has it’s joy in the 11th and thus, the house of hopes/fears/wishes comes from this source. The 11th House is also thought to be the house of the spiritual world servers or servers of humanity–servers of the human race. And therefore the archetype of group consciousness relates to this house as well as “brotherhood”. The Moon here finds strangers to bond with who have shared goals and can make friends who seem more like family than biological family. The 11th house is known to be the house of the ‘soul family’ and finding a niche in relating with humanity or group energy. I know of some astrologers who start interpreting a chart with the 11th house instead of the 1st house, making the 11th the ascendant. 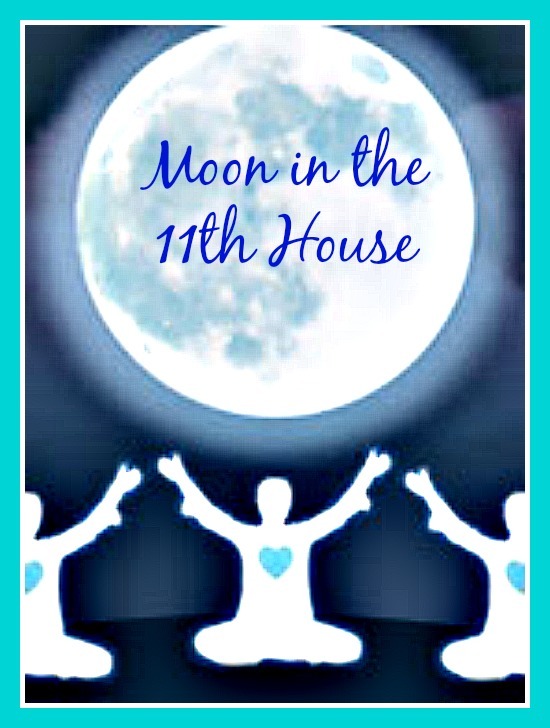 This is because they think of the 11th as the house of the visionary–some people get psychic readings when the Moon is in the 11th because it is though that this house relates to the soul’s vision for the life and the Moon can help them feel the vision as described by the psychic. Dreams and visions of future can be prominent when the Luna moves through house 11 as well so it is good to pay attention to those on the few days a month that your Moon moves through this house. The Moon is now in my 12th house and so I will be back to document this last lunar transit through my own houses as a way to help others understand astrology.